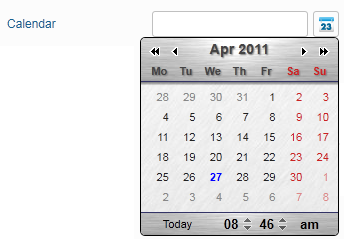 A field "calendar" created, through a pop-up, an element of selecting a date and/or time. 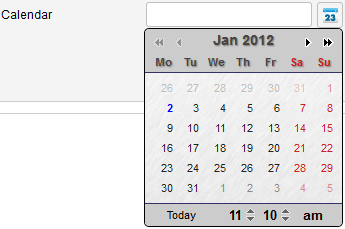 The "calendar" returns the date and/or time as a value. 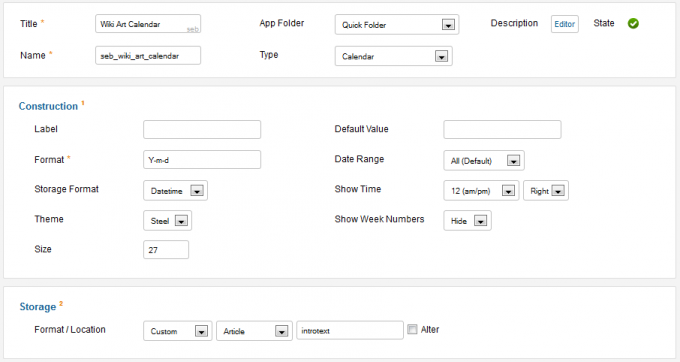 write a code to specify the format of the date and/or time displayed after the selection on the pop-up. For example, if the format is "F d, Y" and the selected date is 12-03-1983, the value "March 12, 1983" is shown. If for the same date, the format is "d-m-y", the value "12-03-83" is displayed. 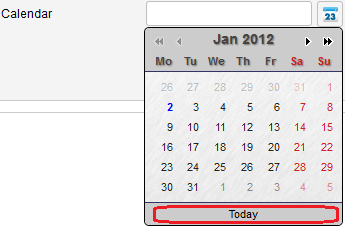 Past: to disable "today" and the dates after "today". 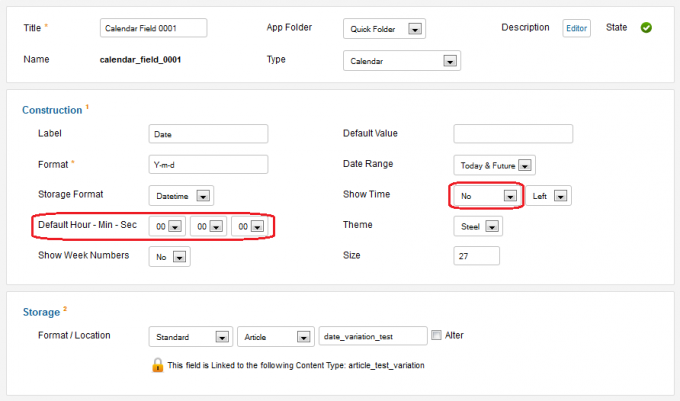 For example, if we If we assume that the date today is "January 2, 2012", and we select this option then "January 2, 2012" and all dates after "January 2, 2012" are disabled. 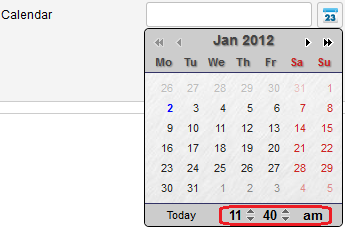 Today & Future: to disable the dates before "today". 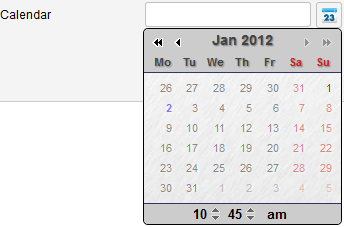 For example, if we If we assume that the date today is "January 2, 2012", and we select this option then all dates before "January 2, 2012" are disabled. 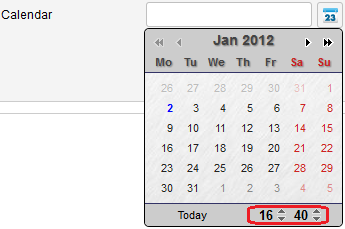 Future: to disable "today" and the dates before "today". Timestamp: to store a date as an integer representing the number of seconds since the Unix Epoch (January 1 1970 00:00:00 GMT). 24(hours): to display a time selector with a hour range from 0 to 23. 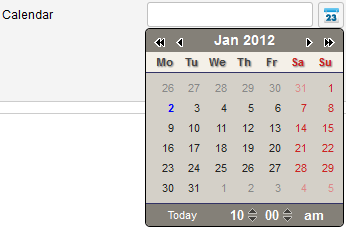 You can place the time selector at the "right bottom" or the "left bottom" of the "calendar" pop-up. 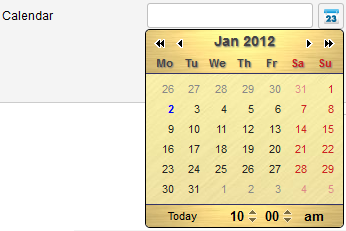 By default, the time selector is placed at the right bottom of the "calendar" pop-up. Use the "Default Hour - Min - Sec" setting if you want to set a time by default. This setting appears when you select option "No" for "Show Time" setting. 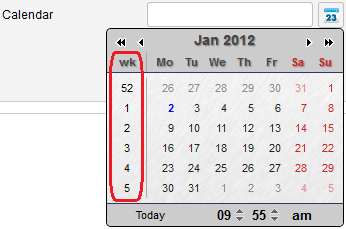 Select Yes to display a week numbers at the left of the "calendar" pop-up.